KFC Fuels Canadians With Brand New $5 Fill-Up! Hungry and in need of a quick and tasty boost, but resources are tight? KFC knows how hard it is to fill up your belly on a budget and is helping Canadians coast to coast with the brand new $5 Fill-Up meal – four tasty meal options including a choice of entrée, drink and dessert, all for just $5.00! There’s nothing else like it, providing the quality, variety and value Canadians are craving. To celebrate the Canadian launch of the $5 Fill-Up, KFC and Colonel Sanders himself presented Canadian consumers with two fun and exciting experiences that put a special spark in their days. $5 Fill-Ups: Making everyday special! To kick-off the launch of its newest meal deal, KFC brought Colonel Sanders himself to Canada to share in the fun. Fans at Yonge-Dundas Square in Toronto, Ontario, were ecstatic to see the Colonel show up at the YouTube FanFest, flocking over to meet and take their photo with him as he provided KFC $5 Fill-Up gift vouchers to hungry and happy patrons. Then, on Wednesday May 6, KFC took over a full service gas station to offer a unique fill-up opportunity for drivers. Appearing pump-side, KFC employees surprised and delighted people by filling up their cars, for free, and providing them with KFC gift cards so they could enjoy a $5 Fill-Up meal at a local KFC restaurant! KFC captured consumers’ elated reactions and fill-up experience – check out the video on KFC Canada’s Facebook page here. 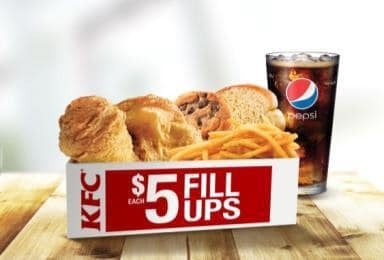 For a limited time only, KFC’s new $5 Fill-Ups prove yet again that consumers don’t have to sacrifice their budgets to satisfy their hunger. 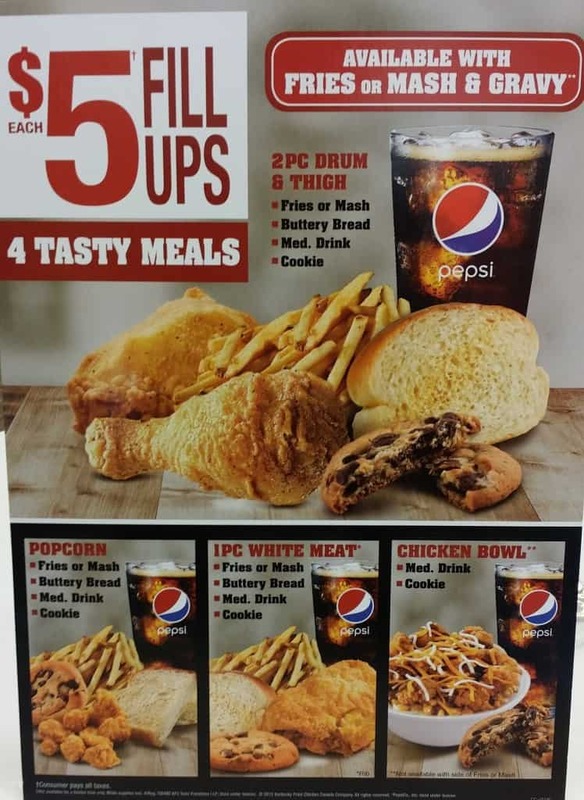 KFC’s $5 Fill-Up meal options include much more to help your dollar go further. How can you compete with a complete, satisfying meal? KFC®’s Original Recipe® begins with locally sourced, grain-fed, 100% Canadian chicken that is always raised without any added hormones. Hand breaded in-store and perfectly cooked every time, the flavour is irresistible. For more information please visit KFC.ca. Today KFC Corporation is a subsidiary of YUM! Brands Inc. and operates more than 15,000 restaurants in 109 countries around the world including more than 700 locations right here in Canada. 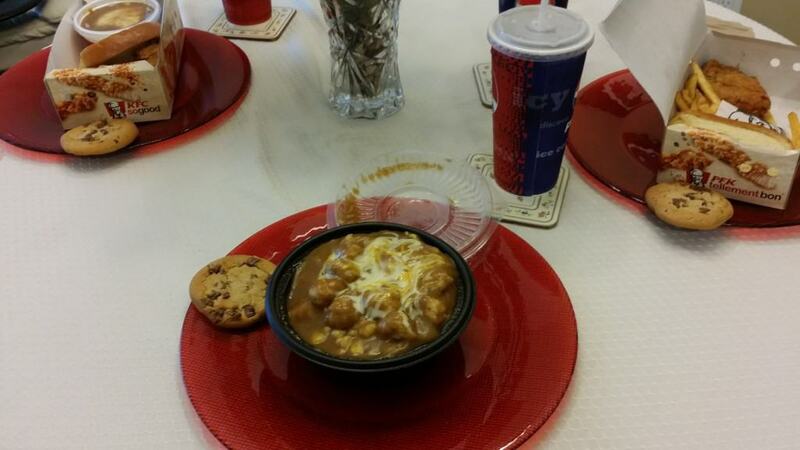 MomMomOnTheGo and crew recently headed out to our local KFC and put their KFC $5 Fill-Ups to the test. They were each $5 plus tax and included everything you needed to have a full tummy. I tried the Chicken bowl which was a new item for me and I really loved it. It was super filling. As a treat, my family does love KFC. So next time we are heading out and want a quick, easy, delicious, filling, and affordable meal out, we will be heading to our local KFC. Which KFC $5 Fill-Up would you pick?